Yannick Nézet-Séguin has been the music director of the Philadelphia Orchestra since 2012. 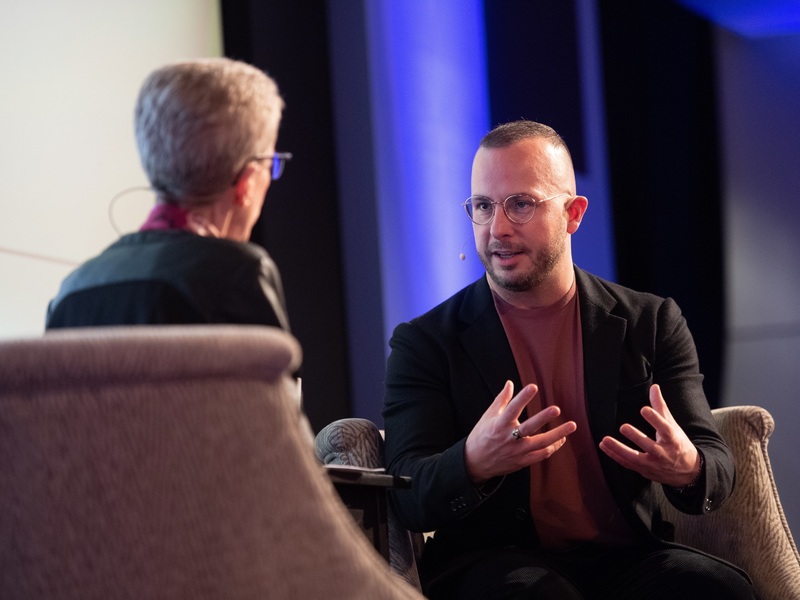 Fresh Air's Terry Gross interviewed conductor Yannick Nézet-Séguin before a live audience at WHYY on April 2, 2019. This is FRESH AIR. I'm Terry Gross. I felt very lucky Tuesday night when I got to interview Yannick Nezet-Seguin, the young, charismatic conductor who now leads two of the world's great music institutions - the Philadelphia Orchestra and the Metropolitan Opera. He's popularly known just as Yannick. That's in part because a lot of people are confused about how to pronounce his name. It's in part because he's so informal. But I think it's also a sign of the affection his audiences have for him. As you'll hear, it's not only wonderful to listen to the music he conducts, it's illuminating to hear him talk about the music. He's committed to interpreting classic works and to presenting new musically adventurous works at the Met and with the Philadelphia Orchestra. Yannick was born in Montreal in 1975, grew up there and continues to return to conduct. He was a guest conductor at orchestras around the world and was the music director of the Rotterdam Philharmonic Orchestra before becoming the conductor and eighth music director of the Philadelphia Orchestra in 2012. 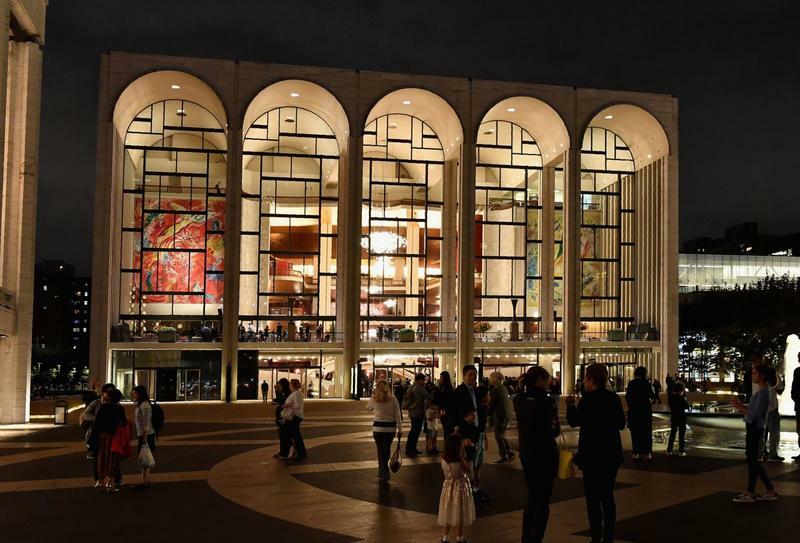 Last year, he became the third music director of the Metropolitan Opera. Our interview was recorded before an audience at WHYY, where FRESH AIR is produced. NEZET-SEGUIN: Well, it's an honor to be here with you, Terry. GROSS: OK. So I've sat in on a rehearsal with you and the Philadelphia Orchestra. I've watched master classes that you've done at Juilliard, which you can see, too, on the prestigious Google. GROSS: And I've seen, like, in the intermission - I guess it was "La Traviata" - a great little, like, intermission feature where you were rehearsing one of the singers and the orchestra. And I have to say - I mean, you're so serious about the music, but when you're interacting with the musicians and singers, you're so informal with them. And I think you bring them up because you're so - you give them such, like, positive - you tell them everything you like about the performance and then tell them the things you want changed. And you're - like I said, you're very informal. And I'm wondering if you think there's a generational shift that has happened in conducting 'cause I think we think of the maestro as being this, like, more authoritarian figure. And you have authority, but you don't seem authoritarian. So I'm wondering how much of it is just, like, you personally and how much you see as a kind of generational shift. NEZET-SEGUIN: ...Whatever the reputation is, which is good. And they can't listen to me because of experience and age. And so what is authority? One thing - the two things they couldn't deprive me from was how much prepared I would be in front of them - so knowing my scores very well and my love for the music. And this is why, very early on, I internalized this love that I should be the one sharing at all time to remind people around me why we all do this. We are there to communicate. We are there to generate some emotion that's been written in the scores we have to play. And for me, I think we understand now more in this generation as a whole. I mean, we're still different, individually, you know? I'm talking about the generation of Gustavo Dudamel and Andris Nelsons, to name my colleagues here in the U.S. But, you know, we all have our different ways of leading. But I think we all understand that it's better to be the one sharing the positive about the music and - in order to get the best. GROSS: So there's an adorable video - a home video of you when you were, like, 10 or 12 or something that's been incorporated into a couple of film features about you. And you knew you wanted to conduct when you were 10. And so in this adorable little home video, like, you're, like - like, you're air-conducting to a record. And what was your conception of what conducting was when you were 10? And compare that to what conducting actually entails. NEZET-SEGUIN: Well, when I watched this video, the disconcerting thing and - which is probably good and bad at the same time - is that I feel I haven't changed. NEZET-SEGUIN: So sometimes I think, well, that means that I still have a long way to go. And on the other hand, that also means that what animated me then is still there. What I can tell you of my decision really - I remember the day exactly and how I felt and the face of my parents when I told them I'm going to become a conductor. And they just looked at me and said - they were playing, like, cards or something on the table in the kitchen - and said, well, sure thing, thinking that, you know, two weeks later, I would want, again, to be an astronaut or something like this, a first responder. But it stuck with me. I had temptations. Mainly, architecture was the big temptation when I was in my early teens. But then conducting - I didn't know why it attracted me. I felt it's almost like a religious call. I think it's also because it made me love music. I was playing the piano for a few years, liked it, but not - didn't love it until I started singing in a choir. And then both completed each other very well. And for me, making music in a group is what animates me. And I think this is what I could feel right away when I was 10 - but having my own role in the group, also, which I could define already at that time by helping others because this is what my parents were teaching me. NEZET-SEGUIN: So I - no, I didn't have any idea how complex or how multilayered it would be and especially how fantastically universal, in a way, it needs to be. You have to be well read. You have to know - if I do a piece of music - a symphony by Brahms with the Philadelphia Orchestra or an opera by Verdi at the Met - I need to know the chamber music of Brahms and the melodies by Verdi and also his string quartet. You need to know the repertoire of everything. And, of course, as you said, the complexity of the scores - it's knowing how every instrument functions. GROSS: But you have to be able to sight read all of that, right? NEZET-SEGUIN: ...And I get - so as you see the page and you identify right away the thoughts and the key words, it's a little bit this way - sight read a score. You have to immediately - your brain starts to know, oh, yeah, the first violins are located here, and they're doubled, of course, by the flute and the oboe. And I - this goes in parallel, but it also requires hours and hours and hours and hours of studying in silence, as opposed to the orchestral musician who has their flute or their violin or their trumpet or their drums. So there's always a sound. It's actually less lonely because you are alone with your instrument, which is another persona in a way, as opposed to the studying of the conducting, which is, along with the score and all the music in your head, not even a sound until it becomes very gregarious and you have to arrive and know the score so well that people think you know it from memory. And you can, of course, have your own vision of how it should sound, like it is in your head, but you also have to listen to what sound is actually produced in order to shape it. GROSS: So in - I think it's in the rehearsal video for "Traviata," you were talking about a marking in the score. And I forget whether it's a piano or fortissimo marking. And you're saying, see that, like, piano - we'll say it was piano - see that piano? Get rid of it. I've examined 40 scores, and it's in none of them. Just forget about it. GROSS: And I was thinking, 40 scores? GROSS: Are there, like, 40 different scores for "Traviata"? Like, do you go through 40 scores, comparing them, before you conduct? NEZET-SEGUIN: ...A figure of style. But let's say, yes, you can examine at least - for this probably, realistically, it was, like, a dozen. You get all the sources, materials, of the different editions of everything. So the first edition. And then nowadays, we get these wonderful editors who go through the manuscripts and the first performing set of parts which Verdi used in Milan, and then where it was used in Paris and so on. There's also the vocal score that has differences with the full score, sometimes. And this is very telling because in the piano-voice score, you get indications from the composer which are not necessarily the same. NEZET-SEGUIN: On a message level. GROSS: I'm thinking about how much cerebral and intellectual work you have to do in order to get to the emotional level, which I'm sure you didn't think about when you were 10. (Laughter). GROSS: Which, you're really - I love to watch you conduct. NEZET-SEGUIN: My model in this is really Leonard Bernstein because he also was saying, expressing, how every bone of the body should express music while on the podium. Why just limit it to the arms? Which is what usually people see. It's the eyes, the eyebrows, the shoulders, the feet. And I'm not of a very tall stature. And actually, most of my colleagues are relatively on the short side. GROSS: I should be a conductor. (Laughter). NEZET-SEGUIN: Well, you are a conductor, Terry. GROSS: (Laughter). No. But I'm short. NEZET-SEGUIN: Well, I think it has to do with the way every part of the body then relates to each other. It's fascinating. It's more unusual to see a very tall and lanky conductor (laughter). We're listening to the interview I recorded Tuesday night with Yannick Nezet-Seguin, the conductor and music director of the Philadelphia Orchestra and the Metropolitan Opera. We'll hear more of the interview after a break. This is FRESH AIR. GROSS: This is FRESH AIR. Let's get back to the interview I recorded this week with conductor Yannick Nezet-Seguin. He's been the music director of the Philadelphia Orchestra since 2012. He became the Metropolitan Opera's music director last year. Our interview was recorded at an event at WHYY in in Philadelphia, where FRESH AIR is produced. So I love hearing you talk about music. So I want to play a piece of music with you conducting the Philadelphia Orchestra. And this is going to be the "Trauermarsch" from Mahler's Fifth. And this has some gut-wrenching chords in it. GROSS: So I want you to tell us - we're just going to hear, like, the opening 60 or 70 seconds. But I want you to tell us what you hear and what you'd like us to listen for. Like, bring out some of the things for us. NEZET-SEGUIN: It starts with this distant yet firm trumpet, which we can imagine is heading an entire mob of people in a very, very dark way, coming from a very distant street, or even in a village. GROSS: This is, like, a funeral march. NEZET-SEGUIN: A funeral moment. And then all of a sudden, you know, when, like, in a movie, you cannot very distinctly see that there's a mob marching somewhere. And all of a sudden, the image arrives, and it's all in front of you. And this is when the percussion just explodes with the whole orchestra after a few seconds. And the whole orchestra seems to be, like, one person crying and saying, why? Why does this happen to us? And it comes back quickly to the real melody of the funeral march, like everybody is resigned to let it happen. And this is probably the few seconds we're going to hear. GROSS: Absolutely. OK. So let's hear it. And this is my guest, Yannick Nezet-Seguin, conducting the Philadelphia Orchestra. GROSS: That is so stirring and so beautifully played. So much of orchestral music and, certainly, opera has to do with death and mortality. And I'm wondering if it's made you think about mortality more, to be so exposed to such deep emotion about mortality through so much of your work and to have to convey - to inhabit that emotion so deeply to be able to convey it to us. NEZET-SEGUIN: This is a theme that, you know, surprisingly or not, I'm thinking about daily since I'm a child because even before music became so important in my life, I was drawing. That was my artistic expression. I was drawing a lot - everything. It had a lot - my drawings to do with the passion of Christ. And I was Catholic, raised Catholic and loved going to church. And for me, my favorite passage was all the passion of Christ and the crucifixion and something I realized is not necessarily the normal theme for kids of 6, 7, 8 years old. NEZET-SEGUIN: And when I started singing in the choir and when I - of course, then, we had immediately to sing those requiems and those great masterpieces and they, of course, naturally led to these operas about death and life after death, these great symphonies like Mahler's and Bruckner's. So I'm so lucky in my life. I have two loving parents - everybody healthy - two wonderful sisters, children. I have great friends. And I've - I consider myself - and I'm eternally grateful that this - I live a happy, a truly happy life. And I believe that, probably, this balance with dealing with such deep and dark emotions - potentially dark emotions - is what gives me the inspiration to bring something out of it. GROSS: Sometimes it's affirmation of your despair. NEZET-SEGUIN: Exactly, simply this. But it's actually comforting to understand that some notes can make you feel this despair and that you're not the only one. 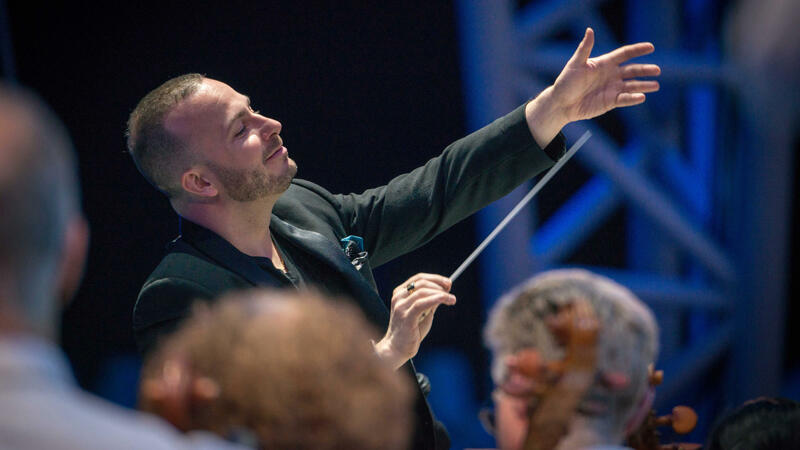 GROSS: We're listening to my interview with conductor Yannick Nezet-Seguin, the music director of the Philadelphia Orchestra and the Metropolitan Opera. Our interview is recorded at an event at WHYY in Philadelphia. After a break, we'll talk more about conducting, and we'll talk about how he's always been out through his career and why that seems especially important to him now. I'm Terry Gross, and this is FRESH AIR. GROSS: This is FRESH AIR. I'm Terry Gross. Let's get back to my interview with conductor Yannick Nezet-Seguin. At age 44, he's leading two of the world's top music institutions. He's been the music director of the Philadelphia Orchestra since 2012 and became the Metropolitan Opera's music director last year. He was born and grew up in Montreal. He's known for his interpretations of the classics and for seeking out new music at the Met and with the Philadelphia Orchestra. Our interview was recorded Tuesday night before an audience at WHYY in Philadelphia, where FRESH AIR is produced. When you're on the podium, like, you're living inside the music. You're experiencing the emotion. But you also, I would imagine, have to be outside the music, standing back outside of it, getting the big picture, tuning it up, making it better where it needs to be. So are you living this kind of double level when you're on the podium? NEZET-SEGUIN: Yes. It's - this is maybe the hardest thing, not to be completely submerged with emotion. That is, so you have to live completely emotionally what it is but also have some part of your brain that's outside to control. Otherwise, it's a - potentially, a train wreck. And that's also a very interesting development that I've gone through as a younger conductor and now a more experienced one because, of course, I was swamped by emotion when I was younger. My piano teacher always used to tell me, you have always to keep your - the mind cold and the heart warm. And this is, I think, what we should always strive for as performers. NEZET-SEGUIN: ...If there ever was - with the Rotterdam Philharmonic. And we were on tour. And I remember one performance, I felt, oh, Yannick, you might not be - I was thinking while on the podium, this one feels maybe a little bit less emotional. That is the performance all my musicians talk about to this day. They felt that this was so powerful. So you then get the level of how your own - as a conductor, your own emotion is different than what the musicians on stage live and, therefore, what the audience has. And it's all this fascinating question of projecting the emotion, which is not exactly the same as living it. GROSS: So you started conducting the Metropolitan Opera in 2009. And last year in 2018, you became the official conductor. The first opera that you did was "Carmen." GROSS: I'm going to - it's one of the most familiar operas. GROSS: Even people who know nothing about opera know parts of "Carmen" because it's just become part of the popular music vocabulary. So I'm just going to play you, like, 15 seconds from "Carmen." OK. You will recognize this. OK. And here's Yannick conducting. GROSS: Did you take it, like, especially fast that time? NEZET-SEGUIN: I think the whole run I did take it fast. NEZET-SEGUIN: I made the right choice. NEZET-SEGUIN: (Laughter) Yes, I remember this. GROSS: OK. And then you said, and I quote, "my profession has twisted so many things." So what were you referring to? NEZET-SEGUIN: Well, I'm referring specifically to the fact that conducting is a way to enable people to give their best. And, of course, that takes a certain amount of control. I talk to you, Terry. And I just think of very much the similarities between what you do and what I do. And you're prepared. You have some questions. But then, you know, if I go somewhere, like any guest, you will just go with the flow and try to just bring it back. And it's this very interesting relationship. So take it - in my world, between conductor and singer, I think we're there to also understand that each singer has a different way to breathe. Each singer has a different color in their voice, a different placement of their voice. And you want the speed that will make it the most beautiful for them and not having just such a plan that, oh, this is my tempo. This is my way. You should breathe there. And this is because I decided so. And that comes from insecurity for conductors because this is actually very difficult, to open yourself up to the suggestion of the other. And what I was referring to precisely there is that sometimes, conductors become too control freaks. And they, actually, want to make sure that everything will be - happen at this moment. And then you force the singer to show you a certain way - the way they will do it because they can't trust that you will be with them. And when I work with younger singers, younger musicians, I want them to set the standard for, also, a younger generation of conductors to be actually talking about making music together not one imposing to the other. GROSS: We're listening to the interview I recorded Tuesday night with Yannick Nezet-Seguin, the conductor and music director of the Philadelphia Orchestra and the Metropolitan Opera. We'll hear more of the interview after a break. This is FRESH AIR. GROSS: This is FRESH AIR. Let's get back to the interview I recorded this week with conductor Yannick Nezet-Seguin, the music director of the Philadelphia Orchestra and the Metropolitan Opera. Our interview was recorded at an event at WHYY in Philadelphia, where FRESH AIR is produced. Is it any more difficult to give critical feedback to a singer than an instrumentalist? - 'cause when you're giving feedback to a singer, it's their body, it's their essence that you're criticizing 'cause there's no intervening instrument, you know? And you can't blame the reed. You can't blame the string. GROSS: You know, it's just - it's your body. NEZET-SEGUIN: There is this very important difference as you - that you just say. But now my life at the moment, because it's so beautifully balanced between symphonic and operatic, I'm trying to actually make sense of the both worlds and trying to, maybe, create less fewer differences between them. And that goes with the vocabulary that we use for an instrumentalist versus a singer. For example, very often at the orchestra in Philadelphia, they know that I can joke because I will give them an image about - this moment is really like a field without trees. And we need to feel that this is more horizontal and more an approach so we are gliding or - whatever it is. And then I will finish jokingly by saying, in other words, more legato. NEZET-SEGUIN: And then they will laugh because I - I try - I think it's our role, sometimes, to give an input in the instrumental world, which is very direct - piu piano, piu forte, you know - so louder, softer, shorter, longer, etc. But sometimes, if you give the right image, it immediately makes the music with a purpose, which is, of course - the purpose is to have a purpose. And therefore, you don't need to say too many of those short, long because immediately, musicians will have this in mind. The opposite is true. The singer - I had a singer last season at the Met. And I tried - I love to do one-on-one coachings, you know, rehearsals. Just the - well, not one-and-one, two-on-one. I would do the pianist, the singer and me. And I started my rehearsal by saying, oh, I think you should hold your note a little bit longer here and have a crescendo at the end of the note. So I started from a very instrumental way. And that singer tried to do it and stopped after a while and said, oh, now I'm all mixed up. And then I gave that singer an image. It's because your pain should be contained at first and then open up. And that was great for the singer to relate immediately with the emotion. GROSS: But why is it vulnerable for you? NEZET-SEGUIN: Because, actually, if some orchestra musicians don't want to go there, they can attack you much more. GROSS: Like attack you how? NEZET-SEGUIN: Well, you know, when I was a guest conductor with - you know, I got - I conducted around 80 orchestras around the world, different orchestras - not 80 times, 80 different groups. So that means 80 times, hundreds people knew and have their own backgrounds and psychologies and everything. So along the way, it was always - it always went well, more or less - maybe excepted to one. GROSS: Because I said so. Yeah. NEZET-SEGUIN: Yeah, because I said so - yeah, then there is no room for this. Or you can just shut it up by being really rude. But then the beautiful space of sharing and of emotional sharing is shut. And that is - that, I believe, is less good for the music. GROSS: I think you're describing being a substitute teacher (laughter). GROSS: Something I've had experience with - not a safe space for anybody in that room (laughter). NEZET-SEGUIN: That's - but that's true. NEZET-SEGUIN: The link with teaching, also - the connection is really important to me, as you know, probably, that everyone in my family being teachers. GROSS: Yeah. Your parents are professors, right? NEZET-SEGUIN: ...School teachers. My grandparents were all teachers. NEZET-SEGUIN: So that aspect is really what connects me - not that I think that a conductor is a teacher, but there is definitely the same - the similarities of sharing a certain knowledge and trying to get the best out of your students by also tailoring the way you will - with each group of people or each individual, the way you will express or deliver that information. GROSS: And her lover has returned because his father has lied to him and sent him away. And now he's back. And they both know she's dying, but he's trying to cover it up and singing, like, oh, you're going to get better. We're going to go to Paris. And - so we're just going to hear, like, minute, minute and a half of this part. And we're going to start where - with her solo part. And then they duet, and he comes in. And this is operating on two levels at the same time - them singing about, yeah, we're going to go to Paris. GROSS: Oh, it's going to be good. And you know they're also singing their despair because she's dying. NEZET-SEGUIN: Because as - yes, definitely. If it were something - relief - about only her side, it would be what we call in minor key. So it would be, actually, something that, physically, we would understand they're very sad. If it were only about him pretending, it would be in a very bright major key. But now, it's actually in A flat major, which is - now it seems very technical if you don't know music - but it's actually a sound that is a darker major key, so the melancholy is already there. So even though we hear a sweet melody, we can somehow, by the genius of Verdi, feel that this is not right. GROSS: Oh, I love what you just said. OK, let's hear it. GROSS: That is so beautiful. And that's my guest Yannick Nezet-Seguin, conducting the Metropolitan Opera with Diana Damrau and Juan Diego Florez from "La Traviata." We'll be back after a break with more of my interview with conductor Yannick Nezet-Seguin, recorded Tuesday night at WHYY before a live audience. This is FRESH AIR. GROSS: This is FRESH AIR. Let's get back to the interview I recorded this week with conductor Yannick Nezet-Seguin, music director of the Philadelphia Orchestra and the Metropolitan Opera. Our interview was recorded at an event at WHYY in Philadelphia. You've been out throughout your career. And it seems like that's important on a personal level, but also on a larger level 'cause there's such a history of closeted musicians and conductors and artists of all kinds. So is it important to you, and probably to many of your listeners, as well, to be out and to have been out and to just have - you know, live that way? And can I mention your partner's here? NEZET-SEGUIN: Yes, of course. Of course. GROSS: Pierre Tourville, who plays viola. NEZET-SEGUIN: The Catholic religion, yes. Catholic Church was everywhere and controlling the education system, and that's until quite recently. So there is still this - every country has its challenges. Let's put it this way. But we never encountered any resistance about it, and we were quite slow and reluctant to be having these kind of things where - OK, I am coming out, you know? It was never this kind of groundbreaking moment. When we arrived here in Philadelphia, Mayor Nutter just welcomed Pierre in the same breath as he welcomed my parents and me in front of city hall. When we were arriving in Rotterdam, it was the same thing. And at the Met, it was the same. And now I feel that there's more responsibility to talk about it because I see so many - and I receive letters from so many young musicians who struggle with this still in our days. And I think they need to see that, yes, it is possible to live a great life where you can actually reconcile your love life and who you are deeply as a person with who you are as an artist. GROSS: I'm going to get to "Traviata" again. When I saw the "Traviata" - the "La Traviata" that you did in HD, the camera was on you as you raised your hands. Well, two things about this - once, when you raised your hands - I think towards the beginning of the second act - you raised your hands to start conducting the second - the baton flew out of your hand. NEZET-SEGUIN: I was embarrassed, but I still laughed, yes (laughter). GROSS: Does that happen a lot? NEZET-SEGUIN: ...The entire world was watching, live in HD, not Diana Damrau and Juan Diego Florez and Quinn Kelsey, but actually, poor old me. So I was - yeah, I thought it was embarrassing, but yes, funny, because things like this can happen. This is live theater. GROSS: I thought it was delightful how you handled it. And then finally, at the beginning of that performance - the beginning of performance of "La Traviata" - the camera's on you. And you closed your eyes for a couple of seconds and then opened them and then began conducting. And I was wondering if you always do that, and what are you doing while your eyes are closed? Is - what's going through your mind? NEZET-SEGUIN: When I'm on the podium, it's immediately about the music. There might be a few smiles to greet the orchestra that I haven't seen. And - but then the music comes right away. And the close - closing my eyes is my own way to connect with what's about to start. Once I'm on the podium, it's only - at that moment, for "Traviata," it's probably just to close my eyes and really being in Violetta's mood, which is really those strings at the beginning - one of the saddest moments of the opera and of opera in general - this incredible melody of the violins that comes back at the last act when she's dying. So this was the moment. Then I tried not to conduct too often with my eyes closed, though, because conducting is - I mean, we've seen great videos of Karajan, for example - always his eyes closed. It's beautiful, but it also means that the musicians have to go to him. I like, as a conductor, to do the opposite - go to the musicians. And for this, I need to create eye contact. NEZET-SEGUIN: ...Terry, it's an honor and a pleasure to be here and to know you and have you in our great city. I wish we could talk even longer. NEZET-SEGUIN: So let's do it again. GROSS: Conductor Yannick Nezet-Seguin is the music director of the Philadelphia Orchestra and the Metropolitan Opera. He has recordings with each. On May 11, he'll conduct the Metropolitan Opera in a performance of Francis Poulenc's "Dialogue Of The Carmelites." Through a live transmission, it will be shown in movie theaters around the country as part of "The Met: Live In HD" series. Our interview was recorded Tuesday night before an audience at WHYY in Philadelphia, where FRESH AIR is produced. The interview was produced and edited for broadcast by Lauren Krenzel and Seth Kelley. Thanks to audio engineers Joyce Lieberman and Charlie Kaier. FRESH AIR's executive producer is Danny Miller. Our interviews and reviews are produced and edited by Amy Salit, Phyllis Myers, Sam Briger, Heidi Saman, Therese Madden, Mooj Zadie and Thea Chaloner. I'm Terry Gross. (SOUNDBITE OF DAVID ZINMAN'S "DER FLIEGENDE HOLLANDER, WWV 63: OUVERTURE") Transcript provided by NPR, Copyright NPR. Mary Jo Heath, host and announcer for the Metropolitan Opera, brings Here & Now‘s Jeremy Hobson five of her favorite works.